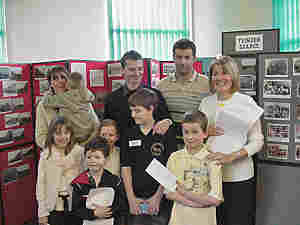 During March local school children were invited to take part in competitions. 3 – 7yrs were asked to paint a picture, 7– 11yrs were asked to write a poem titled My Trimdon. The winners were presented with vouchers for a bicycle and a helmet worth £100 from Halfords in Stockton. Young people aged 11 –16yrs were asked to design a logo for the Joint Trimdon Regeneration Partnership. The winner of this category received a MP4 Player with 1GB extra memory. 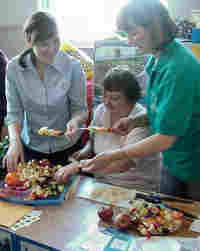 The judges decided to award a special prize for a young entrant whose entry was deemed to be of special merit. 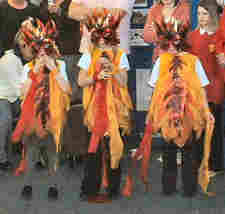 A Dance Troupe from Trimdon Community Nursery and Infant School gave a ‘heated’ performance of the Fire Dance. Following an introduction by 2 of the young dancers to the assembled large crowd of onlookers the music played and the dance began. With confidence and rhythm the dancers swooped and swayed to the music. Wearing their colourful costumes they delighted the enthusiastic audience. and their head teacher, Mrs Fuller who enthusiastically supported the Community Event and encouraged the children and parents to participate. Black belt members of the Taekwondo Club who train in Trimdon Grange Community Centre put on an exhibition of their skills. After warming up with ‘virtual’ fighting they moved on to show their high kicking skills. The 4 instructors of this martial art then demonstrated their expertise with a session freestyle sparring . The club which meets 3 times a week has approx 30 members ranging in skill from white belt to second Dan Black Belt.